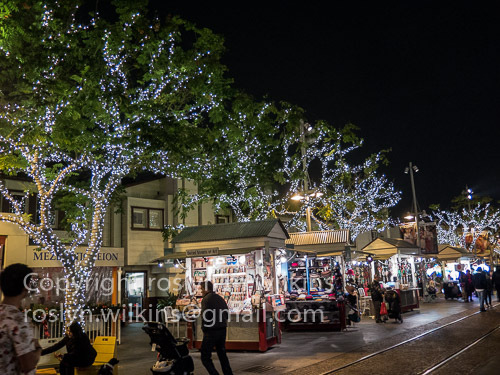 It’s been a while since I posted anything to my blog or caught up with my blogging friends. It’s been one thing after another… mostly good but some not so great… the way life goes. 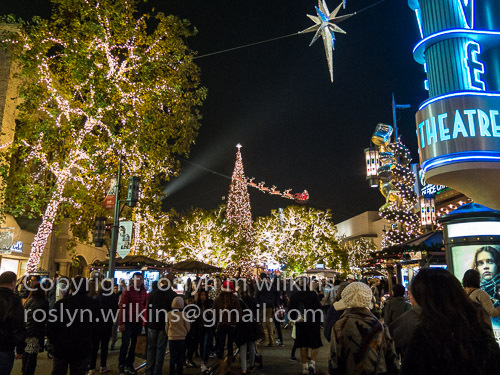 Last Saturday I enjoyed the Christmas lights and entertainment at The Grove with some friends. We ate dinner at Canter’s Deli on Fairfax. Canter’s has been serving food since 1931. Been decades since I was there last. I was surprised at how reasonable the prices are. My friends were all ordering the senior meal so I had to go along. I had half a small tuna sandwich, small cup of soup, small potato salad. I was stuffed. But the senior meal? I am a senior? 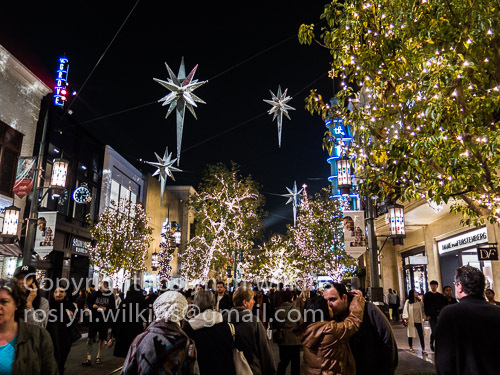 The Grove is an upscale shopping center behind the Original Farmers Market, a tourist destination for lunch when you are on the Los Angeles City Tour. The Farmers Market is very low key, down home. 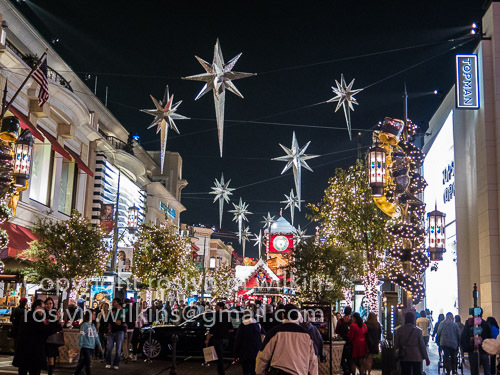 The Grove is the opposite. 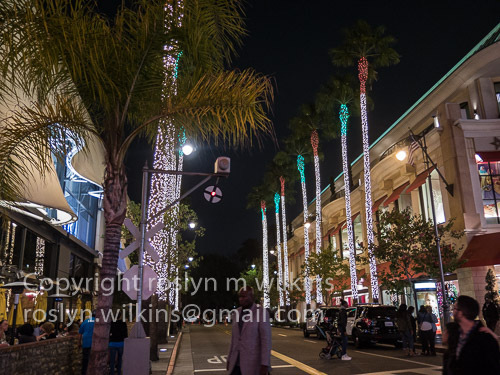 I had been to The Grove a few days earlier with a friend visiting from England but at night all lit up it was spectacular. The Farmers Market originated in the mid 1930s during the depression. A dozen farmers showed up with produce in the back of their pickup trucks to sell to people. 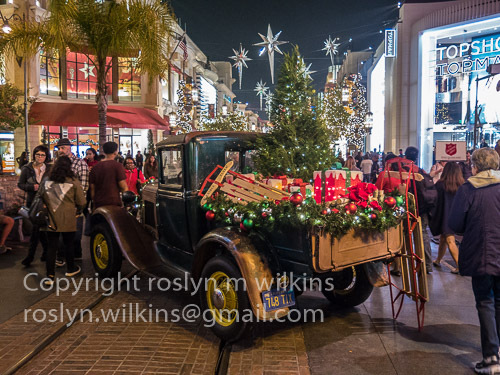 I think this display between the Market and The Grove is an homage to that event. 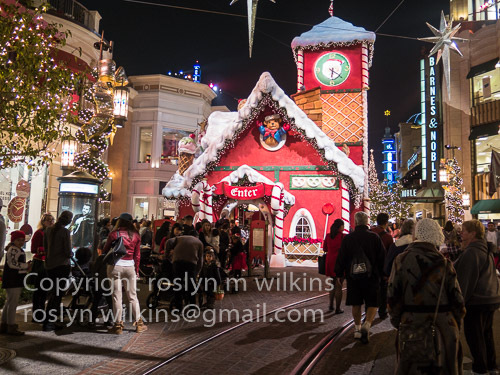 Okay, so now we are walking into The Grove which opened in 2002. 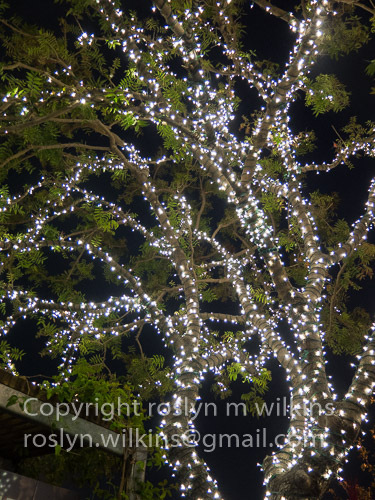 And I am feeling the Christmas spirit. I love it! I HATE crowds but although it was crowded it was not at all uncomfortable. I was enjoying being with my friends and other people out to enjoy the evening. 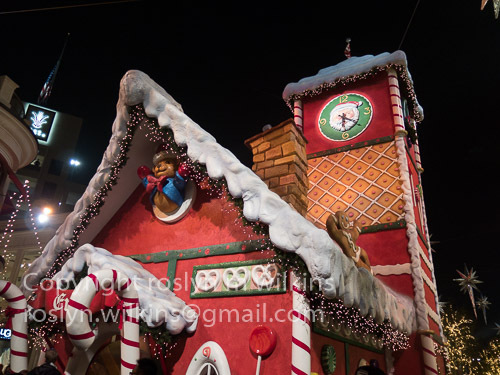 And Santa Claus was ready to receive visitors. And all was right with the world. I need to take my inner child to places like this to escape reality. It’s important. Having fun is a necessary part of a balanced life. I am grateful for my friends and being able to take part in events like this. These moments are precious. Please enjoy the rest of my photos. Click on an image to start the slide show. 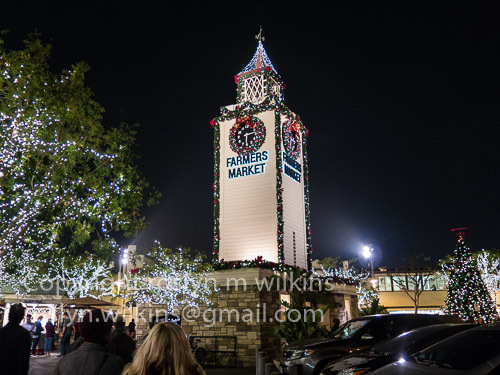 Categories: California, City views, Events, Los Angeles, Photography, Sightseeing, Southern California, Tourist Attractions | Tags: Angelenos, Canter's Deli, Christmas, fun, Holidays, lights, night, Original Farmers Market, Santa Claus, senior meal, The Grove | Permalink.